Woodworking is a love/hate relationship at my studio. 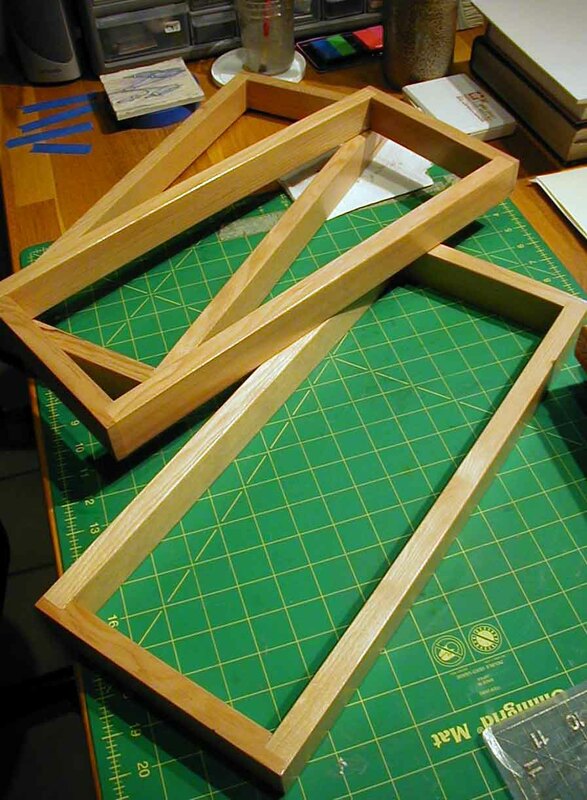 I need to create using wood in order to help display other works, but really lack confidence and tool know how. My father is a good wood crafter, producing furniture, building houses & cabinetry, but I have not yet taken advantage of his knowledge (and he’s 84 yrs young!). I watch many wood programs on PBS, enjoying the tidbits of info gleaned from sitting there for half an hour. However, getting the same thing accomplished in the “wood studio” is a different ball of wax. I keep trying! Eventually the practice will pay off! The Forest Trio (which currently is waiting for the third print) will be available during the July event at the Arts Center. 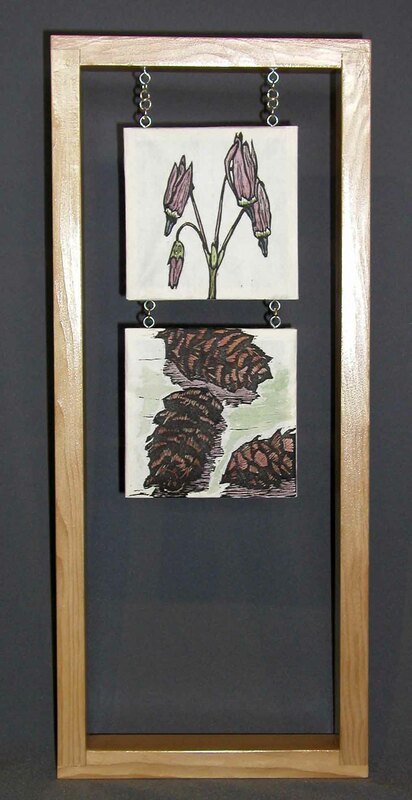 There are quite a few combinations that could be created using the 10 block prints already carved. I’ll be curious to hear people’s response to my new concept. Maybe someone will even PURCHASE one! Oh, forgot to mention that they currently designed to hang on the wall. I hope to create bases eventually for those without wall space (and I do know quite a few people who’s wall spaces are FILLED). Below are the 7 bases for new lamps. Lamps are yet to be made, but they will be soon! 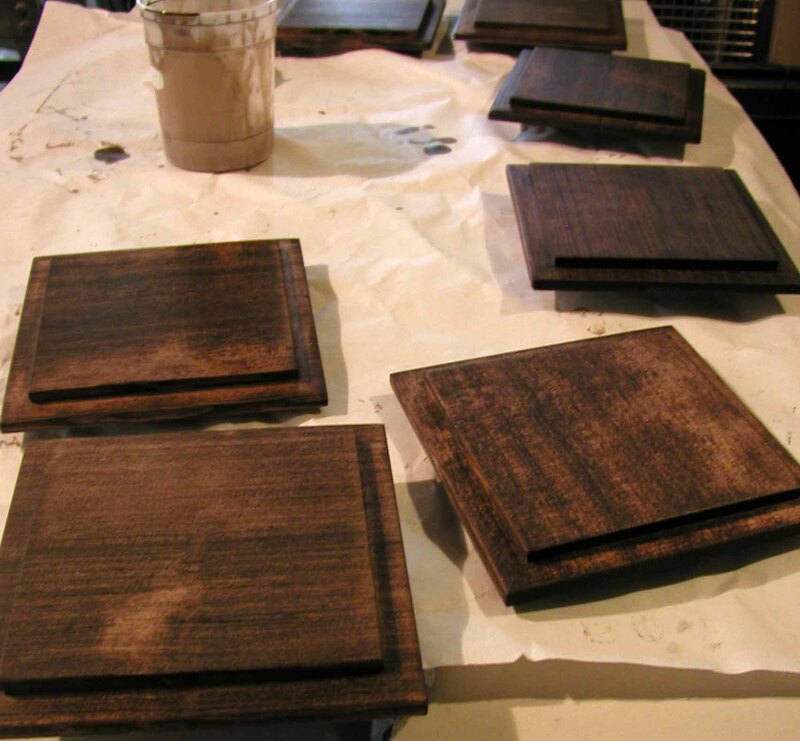 Bases are constructed from hemlock, sanded to 220 grit and stained with a dark walnut Danish Oil. Once dried, 3 to 4 coats of polyurethane will be applied. They were cut & sanded yesterday & stained today. ← Artists @ Work Postcard!